Flashcards are not just for preschoolers. They're great to help anyone memorise facts in a flash. Flashcards, and the Leitner system, is a fantastic tool for memorising and drilling facts. Anything that can be studied in a quick "question and answer" format can be turned into flashcards – things like short definitions, foreign vocabulary, scientific symbols, historical dates, traffic signs, world capitals and other fast facts. Flashcards have no age limit. Adults can use them to learn foreign languages, high school students can use them to memorise exam work and, while there is some controversy around using flashcards to teach very young kids to read and count, they have been very effective in teaching children with disabilities, specifically Down syndrome, to speak and read. A flashcard is a piece of card with a cue on the front, and the answer on the back. The cue can be a question, a single word or a picture. Electronic flashcards can also have sound or video cues. When you review your flashcards, you will take one card at a time, look at the cue and try to answer it as quickly as possible before checking the answer and moving on to the next card. Can you remember every single fact you've read in a text book? Probably not! That's because when we read through something passively, our brains are not forced to think. But when we have to answer questions, our brains are triggered to take action. By using flashcards, our brains are constantly stimulated to actively recall information, and so that information is stored in our memories more effectively and for a longer time. When you make and use flashcards, you take control of your own learning. You have to decide what to put on each card, how often you're going to use them, then evaluate how well you know the information on each card. By doing all these things, you are using "metacognitive processes", which have been proven to enhance long-term learning. 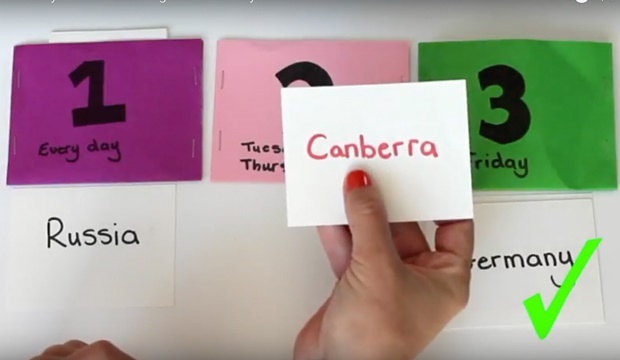 Flashcards help you to practise the same information over and over again - and as we know, practice makes perfect! Keep it as short as possible. For example, if you're studying world capitals, you don't have to write "What is the capital of Russia?" on the front. Simply write the country's name. Although some people do use flashcards to study essay-type questions, they're usually more effective if they have only one question and one answer per card. How do I use my flashcards? Flashcards are not an effective method for last-minute cramming! So whatever method you choose, start at least 3-5 days before your test. Better yet, make your flashcards as soon as you've learnt the topic in class. It may seem ideal to carry your flashcards with you wherever you go and to study a few of them whenever you get a chance. But believe it or not, this may not be such an effective method. Studies have found that it's more effective to review a whole stack of cards in one sitting, using spaced repetition, than to study a couple here and there. Spaced repetition is one of the most effective ways of using flashcards. This is when you review your cards at specific, increasing intervals: for example on Day 1, Day 2, Day 4, Day 8 and so on. Spaced repetition works because it activates your long-term memory, while leaving small breaks in-between studying uses your short-term memory. You can read more about spaced repetition here. Use the Leitner system of learning with flashcards. The Leitner system is a well-known and very effective method of using flashcards. It's a form of spaced repetition that help you study the cards you don't know more often than the cards you already know well. Here's a simple example using three boxes (though some people use as many as seven). 1. You'll need: your stack of flashcards and three boxes. 3. Review your cards according to your schedule of spaced repetition. Put all your cards in Box 1 and review them. If you get a card right, move it to Box 2. If you get it wrong, it stays in Box 1.
Review Box 1 (as on Day 1: move correct cards up to Box 2, but keep incorrect cards in Box 1). Review Box 2. If you get a card right, move it up to Box 3. If you get it wrong, move it back to Box 1.
Review Box 3. If you get a card right, it can leave the box and you don't have to study it again. If you get it wrong, it goes all the way back to Box 1.
Review Box 1 and Box 2.
Review Box 1, Box 2 and Box 3. Once all your cards have left Box 1, you're studying is done. Time for your exam! Does your child use flashcards when he or she studies? Do they use a technique we haven't mentioned here? Have you found the Leitner system useful? Send your comments to chatback@parent24.com.